New York: Oxford University Press, 2000, 382 pp. To order: go to www.oup-usa.org and click "order" at the bottom of the page. "The method by Ritchie and Stauffer is a masterwork of scholastic pedagogy, reflecting all of the latest performance practice research and appealing to the serious organ student." "George Ritchie and George Stauffer are to be commended for compiling one of the most comprehensive organ methods available today....Surely the Ritchie-Stauffer method will find wide use and acceptance well into the 21st century." "With the increased interest in historical performance styles, the task of writing (and indeed reviewing) a method in organ technique and performance has become considerably more complex. On the one hand, the incipient performer needs guidance in basic technique, posture, and approach to performance; on the other, the modern writer feels enjoined to provide statements and advice that are historically appropriate, or at least plausible. And these two issues are related in complex ways: the basic technique, posture, approach to performance are themselves historically contingent; furthermore, not every historical technique is necessarily "good" and none should be uncritically accepted....Organ Technique: Modern and Early is the first major organ method to present two fundamentally distinct historical styles of technique and performance (one for the 'modern' repertory after 1750 and one for the 'early' repertory before 1750)....The chapters on the basic playing forms in 'modern' technique are clear and carefully paced, providing simple pedagogical pieces by composers such as Lemmens, Léon Boëllmann, and Marcel Dupré. 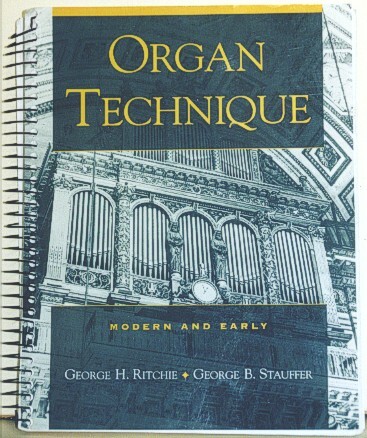 Throughout, the authors successfully blend a practical and pragmatic approach with a scholarly sensitivity to the original nineteenth-century literature on organ technique (most notably the method of Lemmens)....The 'early' chapters maintain the same judicious blend of pragmatic advice and historical fidelity as those devoted to 'modern' technique....In short, this method covers a wider range of issues and provides a broader basis of organ study than any previous publication....I picked up only a few errors on a single detailed reading....These should not detract from the tremendous value of the book, which should, in any case, inspire the young player to study and explore beyond its limits." "This volume acknowledges the fissure that has opened - largely since about 1964 - between organ playing grounded in the vision of one instrument and one technique designed for the whole repertory and that committed to specialized instruments and techniques for the repertory of specific times and places; moreover, the authors seek to work with this tension as a strength of the postmodern condition. By salvaging the authority of the former for much Romantic and modern literature, codifying for students the vagaries of the latter (with a focus that never really loses sight of Bach), they provide a new and provocative way of teaching organ performance. . . .
"While many of Ritchie and Stauffer's contemporaries have abandoned a one-size-fits-all approach to the organ itself (relegating the neo-classical organ, designed to play the entire repertory, to a phase of history that is now over), these two organists have gone further than most in seeking to discard a similar approach to teaching organ technique. With an appealing tone that is both serious and optimistic, yet includes occasional asides of homespun advice, they juxtapose a detailed discussion of the standard way the organ has been taught for the last century or so, following principles developed in the middle of the nineteenth century, with an equally systematic method for playing early music, defined chiefly as the music of Bach. "Much of what the authors do with the traditional (i.e., 'modern') approach to playing the organ is not new. (This material has, after all, been discussed in numerous treatises over the last hundred years.) Their first two chapters, however, do provide a particularly elegant presentation of this tradition, enriched by an impressive musicological rigour that in itself sets a new standard for such an undertaking. . . .
"Not every organ student aspires to be a university organist: some study the instrument in order to play hymns in church (or because their parents would like them to do so), while others just want to play the Toccata and Fugue in D minor (and are not bothered if it is really by Bach, originally for the organ, or even belongs in D minor). Yet for students with eyes (and ears) wide open to the whole of the field, in a position to understand the instrument and its music as historical artefacts - indeed, as a magnificent legacy from the past - and not merely as vehicles for self-promotion, this book will be a wonderful resource."